Let me start today's post by wishing my wonderful husband a FABULOUS 40th birthday! I can't believe that number. Shoot, I remember when I thought 30 was old. sigh. In other news, it's Bead Table Wednesday and I've got very little to share today. After my funk on Monday, I found that the only cure was starting on something new and less taxing on my brain. Earrings it was! One of my best friends just had her birthday and has requested some earrings from me as her gift. I've got a few in the works and a few more laid out to get started. Here are the ones that just need ear wires. As well, my pieces for the One Crayon Color Hop are sitting on my desk ready to be photographed. Here's a sneak peek for you! That's really all I have on the bead table at the moment. I apologize that it's not more exciting but I think a laid back table is what I need right now anyway. 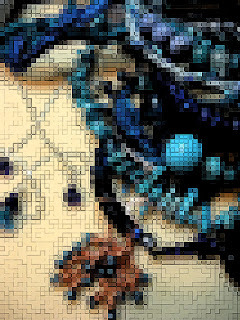 There's definitely some more exciting Bead Table Wednesday in the Flickr Group. Here's what's new in the shop. 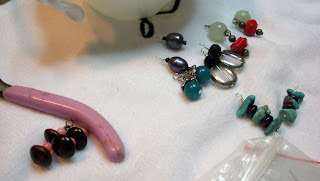 I better get back to pampering my old man of a husband and making some earrings. Here's hoping you have a great Hump day!